Now I find myself, a bread lover but avowed non-baker, making at least 32 loaves of sourdough a week. A bread whose ingredients - only flours, water, salt, and starter - need to be adjusted depending on timing and humidity; whose source of flavor (and of life), the starter, needs to be maintained and nurtured almost daily between batches; a bread whose final texture and shape is formed in your hands and not in a pan. This was daunting. For the first few weeks I scraped by, largely on a steadfast reliance on Ian’s recipe (and on Ian himself, usually around as bread prep was happening). My first few loaves were far from perfect. Some wouldn’t rise properly others were misshapen. Some batches browned inconsistently, while others were consistently “well-done” on their bottoms. It wasn’t easy, but I’d be lying if I said it wasn’t fun. And, per my predictions, the quest for the perfect loaf was starting to become as addictive as a fresh from the oven slice with butter and jam. Then, two weeks ago I met Michael Sellers of Journeyman Bakery while assisting his Secrets of Sourdough class. Only a few years ago Michael, like me, found himself at The Farm Cooking School taking an introductory baking class, Breadmaking 101. Within a week, like me, he found himself leaving a career that left him unfulfilled to intern at The Farm Cooking School. Since then, he’s toured the country studying breadmaking and has made his passion his career, opening Journeyman, a CSA-style Bakery, in 2016. Watching him as he taught class, large hands deftly kneading the doughs before gently shaping them into loaves, he looked...exhausted. It turns out artisanal bakers keep hours akin to ER docs and air traffic controllers (and the object of their work can often feel equally vital). Michael was operating on only a few hours of sleep, baking all night and driving down from Peekskill that morning to teach the class. So yes, Michael was exhausted, but it was obvious he was so happy too, to be practicing and sharing what he loves. He helped me and the other students to realize that bread baking didn’t have to be overwhelming. Measurements could be imprecise (okay, to within a few grams) and as it turns out you don’t need to bring your starter with you when you fly (I haven’t tried yet, but Michael introduced a technique for dehydrating and freezing your starter in flakes to reconstitute later, much like the store-bought product). As I’ve come to understand the feel of the dough I’ve begun to realize that it’s far more forgiving than I had first thought (an overly gentle approach with doughs was among my chief problems as a “non-baker”) and am increasingly confident as I mix, shape, and bake my loaves. Of course, those problems outlined above haven’t gone away completely, I’ve just begun to learn - with Ian’s guidance - to identify the possible causes, make minor changes, and to hope for the best with tomorrow’s batch. Dough’s unwieldy and hard to shape? Reduce the water. Loaves seem to be losing their rise? Shorten autolyse (an initial rest of mixed flours and water which begins gluten development and makes for a more workable dough) and proofing time, maybe even toss a few tablespoons of water onto the floor of the oven to imitate those steam injection doodads which are definitely out of our price range. Too few customers purchased a loaf? Eat it yourself. The result: my loaves are improving. That said, your standards also tend to grow with increased success, and the more you bake the more obsessive you can become about baking the perfect loaf. Like with anything in the kitchen, baking is a practice, and the luxury of having the time and resources to hone this craft is something I’m grateful for (as begrudging as I initially might have been to add a sourdough obsession to my life). Writing this a month after I started, my bread is still inconsistent. But so is the weather, and our ovens, and the invisible … of yeast which we feed every week to give our loaves life. But I’m no longer as daunted. Nor should I be. Bread is bread: crusty, sugary, starchy, salty. A bit of everything we crave, and so so delicious for it. 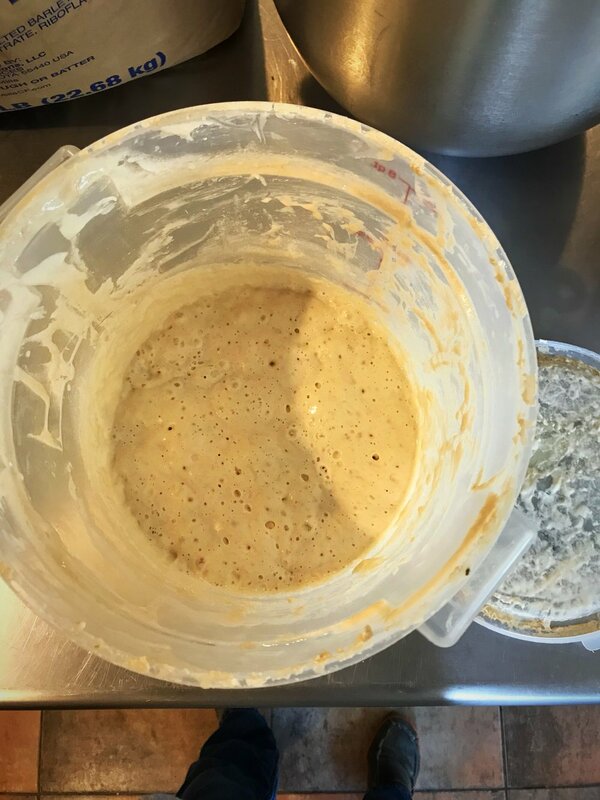 We typically make our bread using only natural yeast (a starter) to provide both flavor and lift. That said we’re not snobs and adding some commercial yeast is fine if you’d like some extra lift, and especially if you’re looking to eat bread in 4 hours rather than tomorrow (your starter is still essential to the bread’s flavor). Place the water, starter, and yeast in the bowl of a stand mixer fitted with the paddle attachment. With your mixer on low, gradually add the flours and salt and mix until just combined. Increase the speed of the mixer to high and knead until very elastic, about 4 minutes. Remove bowl from mixer and cover with a kitchen towel. Let rise at warm room temperature until doubled in size, about 2 hours if using yeast and overnight if not. Heat the oven to 450°F, putting the empty cast iron pot with lid in the oven to heat for at least 1 hour. In the meantime, turn out the risen dough onto a floured work surface and shape into a round by pulling the outer edges up and into the center, working all the way around the dough. Place the dough, seam side down, in a well-floured cloth-lined bowl. Dust the dough with flour, then cover with a kitchen towel and let rise a second time until the loaf doubles in size, about 1 hour. Remove the preheated pot from the oven and remove the lid. Invert the loaf into the pot and slash the dough with a razor blade. Put the lid back on and return pot with bread to oven and bake 30 minutes. Remove the lid and bake until well browned, 10 to 15 minutes more. Transfer the bread to a rack to cool completely before slicing. Combine all ingredients in a bowl. Stir then knead together into a ball the texture of a thick bread dough. Keep in bowl covered with plastic wrap 3 days. Then discard half of mixture and feed with 2 parts flour to 1 part water every other day.